A Bulldog style harness goes across the upper chest, drawing the eye to the shoulders. Many body types look great in this style, so it's a matter of taste. We offer this harness in eight beautiful leather colors. We use high quality, sensual leather. A handcrafted product with a eye-catching look and an amazing feel. The Bulldog is a masculine look. Four rings, two front and two back, and six buckles, four in front and two in back, connected with heavy leather straps. This piece is heavy on hardware. Whether your parts are factory stock, or after market does not matter. The Bulldog harness says, "I'm me, deal with it". All of our harnesses are made from the first quality, back portion of the hide, ensuring the best grain and consistent wear throughout the entire piece. Every harness is constructed from a double layer of chap weight leather, making all of our gear feel amazing against the skin. Double stitching minimizes stretching, but still allows the straps to perfectly mold to your body with wear. Given proper care, this harness will last you a lifetime. The best thing about this leather is the way it feels against the skin. Many customers tell us their Amici harnesses are their favorite thing to wear for play. Molded to your body, it's a piece of gear that holds you just right during the most important moments. This harness also makes a daring fashion accessory. Over clothes or skin, the grip of leather remains extremely pleasurable. Proper attire at leather events and bars, but welcome in many scenarios. Every order is made to your specifications, and there are many custom options are available during ordering to tailor your harness to exactly what you want. 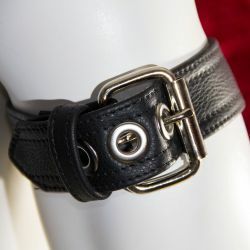 This piece is adjustable with heavy metal buckles to account for changes in your body over time. Black leather is traditional, especially with silver hardware. That is the default option in our ordering process. But we also offer this harness in eight beautiful leather colors. The leather we use is all high quality, and the dyed leathers are as sensual as the black leather. Another option, if you want to stick with black leather, is to change the stitching thread color. That lets you coordinate and flag, but take advantage of the fact that black looks good on everyone. The hardware (roller buckles, grommets and rivets) are offered in three colors, to tie the whole thing together. Silver, black, or antique gold. That is literally hundreds of combinations. You can use the Visualizer to browse looks.